The first of its kind amongst all U.S. carriers, United Airlines now features 180-degree flat-bed seats and personal on-demand entertainment in the premium cabins on all scheduled, long-haul international flights from the airline’s eight North American hubs. United has outfitted 183 international long-haul aircraft with United Global First and United BusinessFirst cabins, and offers more than 7,000 total flat-bed seats fleet-wide, more than any other U.S. carrier. 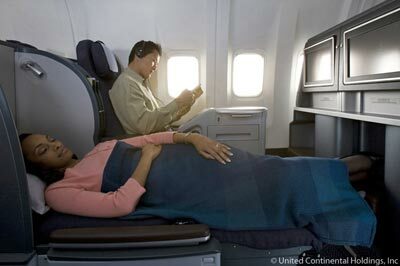 Extra-legroom Economy Plus seating on nearly 650 mainline aircraft and approximately 150 regional jets. Provided currently. The transcontinental “p.s.” Premium Service fleet of aircraft flying between New York Kennedy and Los Angeles and San Francisco will experience an improved premium cabin with fully flat-bed seats, faster Wi-Fi Internet service, and personal on-demand entertainment at every seat. Offer inflight connectivity on long-haul international flights. The airline expects to have more than 200 aircraft outfitted with satellite Wi-Fi before the end of the year.